When treating damage caused by a dental cavity, the lost structure must be replenished with a “filling” material. Traditionally, dentists have relied on amalgam, which contains silver/mercury. 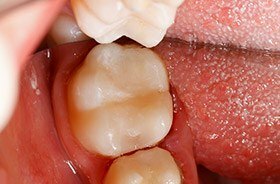 These types of fillings have a dark, unnatural appearance, and they also carried a risk of fracturing. Thankfully, today’s advancements have led to tooth-colored fillings. This restorative method offers several benefits compared to traditional fillings, including improved aesthetics and a direct bond to the tooth enamel that helps prevent further damage. Your smile will look brighter and more confident following treatment here at Torrington Dental Care! Why Choose Torrington Dental Care for Tooth-Colored Fillings? Instead of a metal amalgam, tooth-colored fillings are actually made of a plastic-based composite resin. It comes in a variety of natural shades, meaning it can be custom-matched to any patient’s enamel color. That way, the restoration itself will end up looking just like regular dental structure. Even better, because the material is metal-free, patients won’t experience an increase in temperature sensitivity like with a traditional filling. Do you have a small cavity that is in need of repair? If so, give our team a call today.